I’m currently planning a lil’ trip to Mexico this summer (mainly for my best friend’s wedding) and am super amped about spending a night or two in Mexico City. Josh is excited about fancy, five-star Michelin restaurants, while I’m mostly excited about churros on the street. I want a piping hot churro, as big as my face! served in a paper sleeve. I know I live in Los Angeles and have experienced a good churro but I’m hoping there even better there. Churro-making is reserved for those special occasions because they require a bit of hot oil. 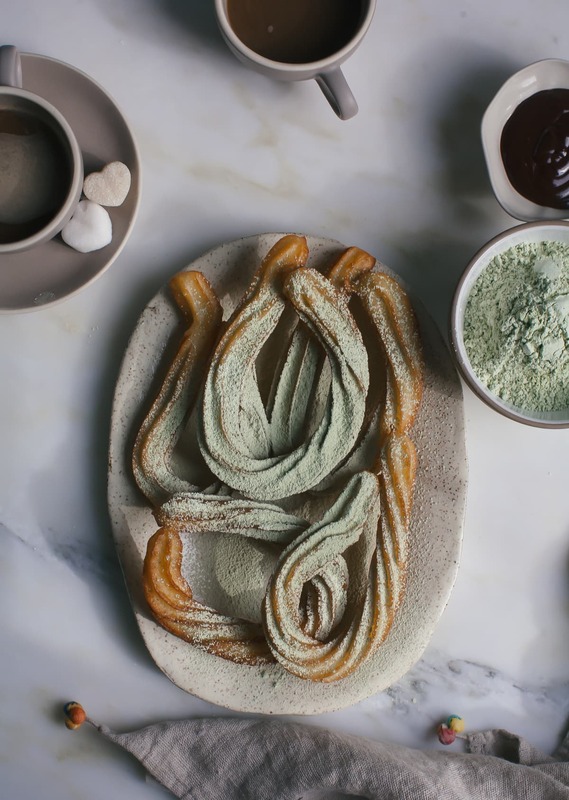 And no, no one should be baking churros. NO ONE. I usually reserve churro-making for that time when I want to see grown adults get all starry-eyed and excited about something fried and sweet. The matcha sugar that’s dusted all over is the thing that will seal the deal. 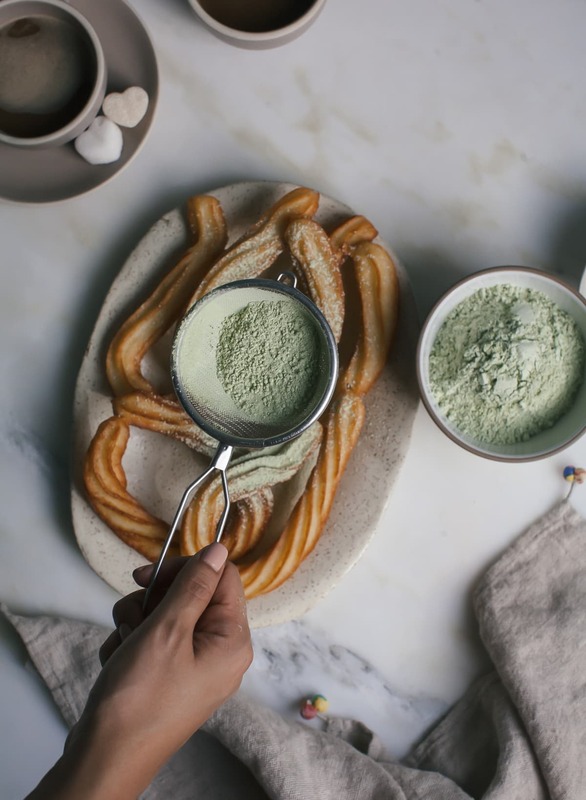 The matcha sugar was inspired by Dominique Ansels’ matcha beignets that he served at his pop-up in Japan. Man, I when I saw a photo of these, I wanted to stop everything that I was doing and face dive RIGHT INTO THEM. I like to make my churros from a choux type dough. The same you’d use to make eclairs or cream puffs. 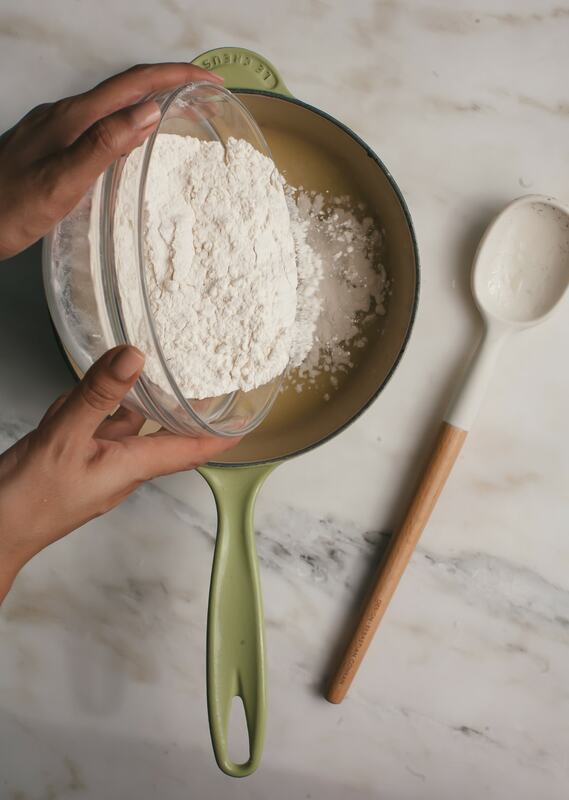 It’s the simplest dough and comes together in less than 15 minutes. 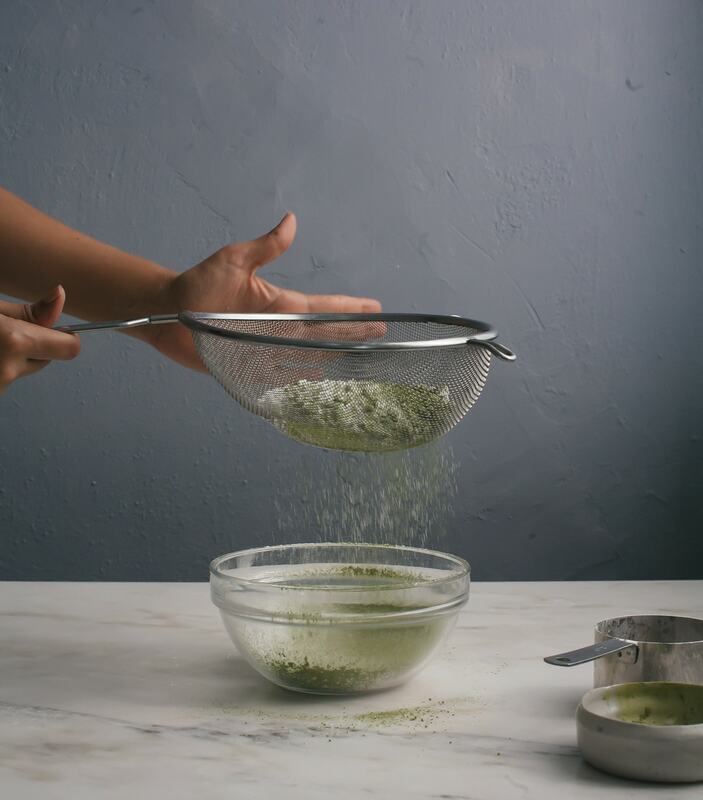 To make the matcha sugar: sift the powdered sugar and matcha powder together. Stir and set aside. To make the chocolate ganache: combine the chocolate chips and heavy cream in a small bowl. Microwave for 30 seconds to a minute and stir until melted. If you don’t own a microwave (I just got one), you can heat the two together in a double-boiler (or a bowl nestled in a saucepan filled with a few inches of water) and stir until melted. Set aside. In a medium saucepan, bring the water, butter, vanilla bean seeds and salt to a roiling boil. Stir in the flour all at once. 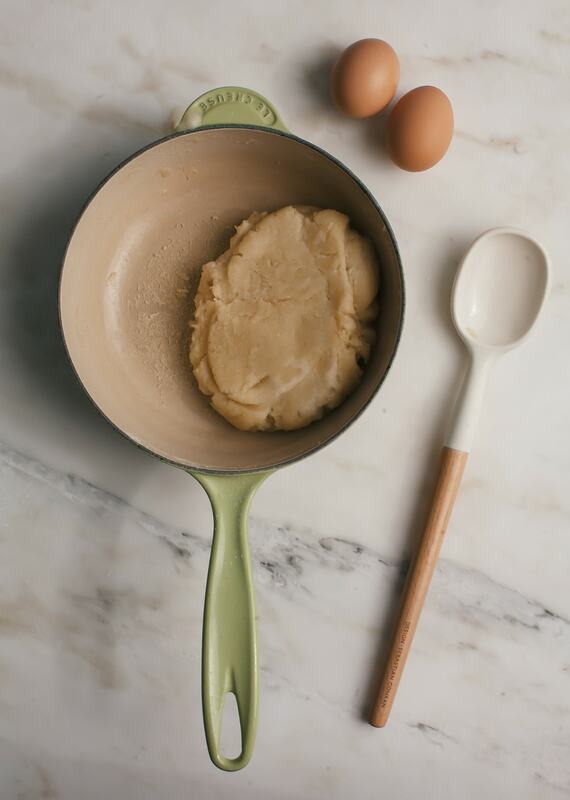 Reduce the heat to low and stir, using a wooden spoon, vigorously until the mixture forms a ball and begins to pull away from the pan, about 1 minute. Remove the pan from the heat. Let the batter sit for 5 minutes to cool. When it’s warm (not hot) to the touch, add one egg at a time. Keep stirring until the mixture comes together and is smooth. It might seem squishy for a while, keep going! Note: You can also do this in an electric stand-up mixer with a paddle attachment–it’ll go faster. In a cast iron skillet, add 3 inches of oil and place over medium-high heat. When the oil reaches 325 degrees F, it’s ready. 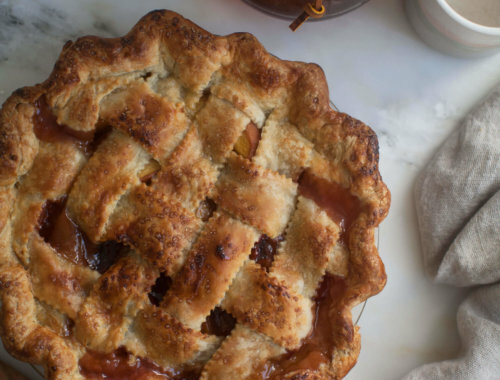 You may need to bring the heat down to medium-low to keep it around 325 degrees F to 335 degree range. 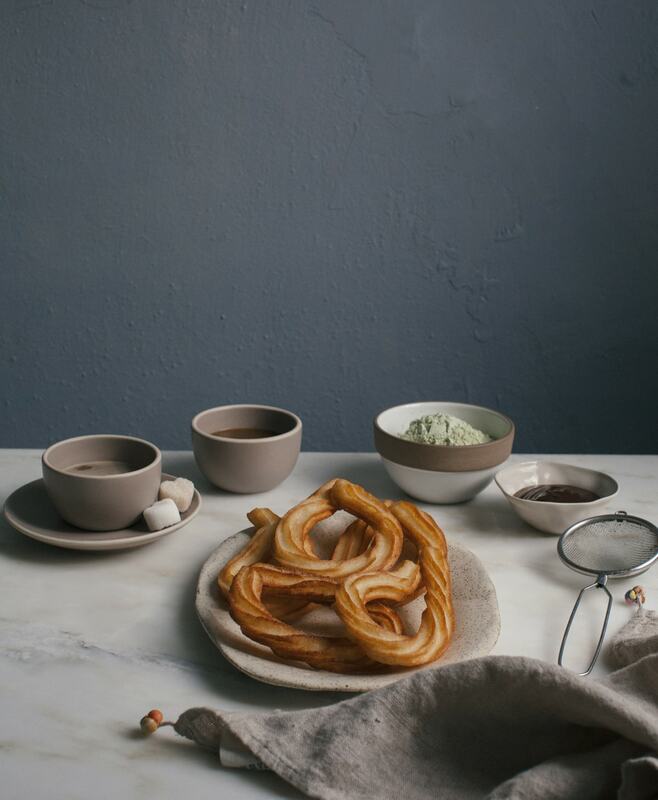 Spoon the churro dough into a piping bag fitted with a large star-tip. Have sterilized scissors on hand. Hold the bag over the hot oil, squeeze a strip of dough that’s about 4 inches long or you can do like I did which was more of a horse shoe shape (see tip below on keeping its shape) and then snip it with the scissors and let it drop into the oil. (This works great with two people.) Repeat with the second churro. I fit around 2 to 3 churros in the pan. Fry on each side for about 1 minute and then flip and fry on the opposite side for an additional minute. Drain on paper towels and repeat until you’ve worked your way through the dough. 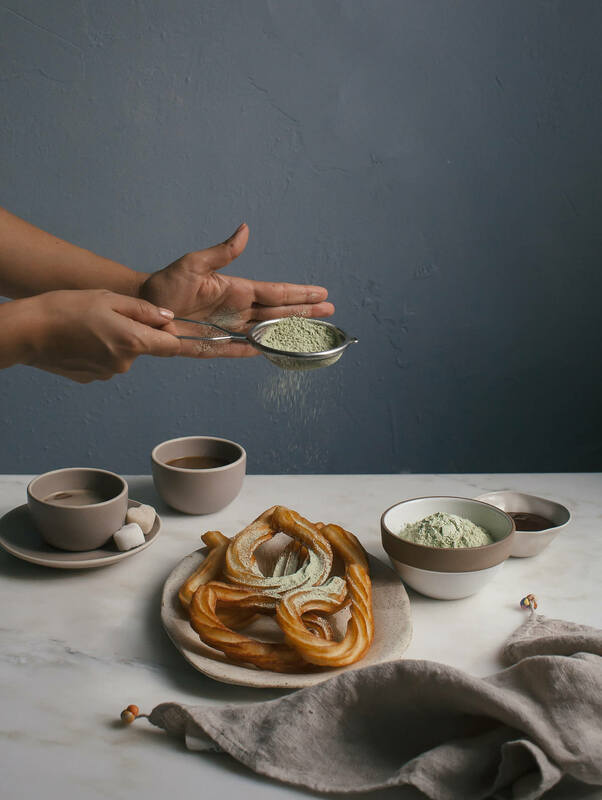 Dust with the combination of matcha and powdered sugar and serve with a little bowl of chocolate ganache. 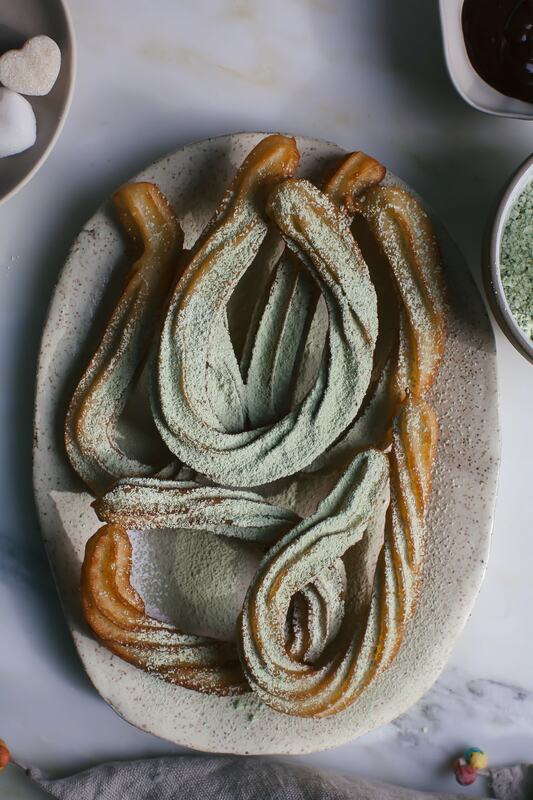 To make the horseshoe shaped churros, squeeze the churro dough into the hot oil, twisting it around to make a horseshoe type shape. Snip the dough with the scissors. 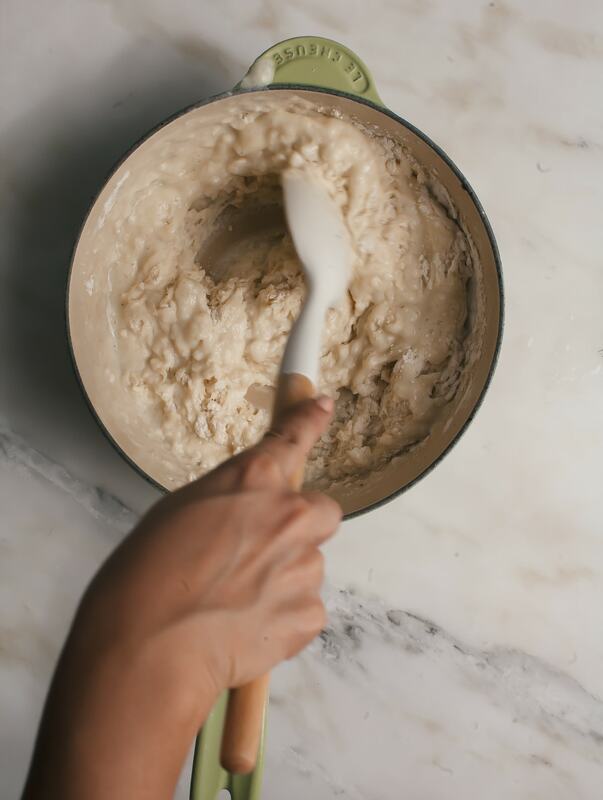 You’ll notice that the dough will want to stray away from the other, using your tongs hold the dough in place for about 30 seconds and then release—it’ll hold its shape! Omg, YES! These are calling to me like crazy! They look amazing! These look so amazing and the matcha icing sugar looks wonderful! I love churros so, so much. Wow, even just the way those are twisted looks unbelievably gorgeous! You always inspire me to be more creative in my cooking & baking! Thanks for sharing! Thank you, Mollie. You’re so sweet. What kind of matcha do you use? I’ve been wanting to purchase some but feel a bit lost as to which is best. If I’m baking, I always try and use culinary matcha because it’s much cheaper than ones that are labeled ceremonial. Yum! We just got back last week from Cancun, Mexico and YES we went right up to the street vendor and bought two bags of delicious hot churros, dipped in cinnamon sugar. Can’t wait to go back next year. I’m so excited for this to be me! ah! these are gorgeous. I haven’t worked much with matcha, but maybe this would be something good to start off with. I mean, what’s not better with a dusting of powdered sugar? you can put the powdered sugar matcha combo on anything: french toast, pancakes, doughtnuts, a cake, etc. duuuuddeee. i saw these on your insta a few days ago and have been waiting for them since. amazing. Ahh I was just in Mexico and had the most amazing churros from a little street vendor. I’m going to dream about them until we go back. I don’t know if anything can measure up to those, but these look pretty beautiful! thanks, heather! and i totally understand. it’s hard to beat fresh out of the fryer in mexico type of churros. 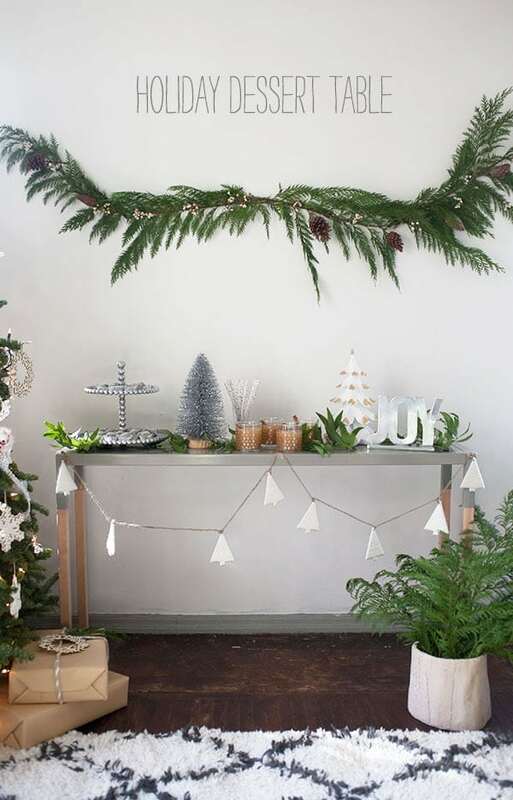 Yes to all of this! These look so amazing! Awww yay! I will. I’ll only be in Mexico City for a few days but I’m so excited. I hear it’s amazing. I’ll be in Cabo for the wedding, which I’m excited to visit too. Mexico City is the best. My people know how to eat. Oh yes please! That would be awesome. Hotel Villa Condesa in la Condesa (obvs) was so pretty and in a great neighborhood. Word of warning though: the old hardwood floors are LOUD. Try to stay on the 2nd floor so you get a balcony 🙂 The included breakfast is pretty damn delicious. And the sopa azteca they have at the hotel restaurant is the bomb (please try and replicate it if you do stay here). Yum!! What’s your favorite churro place in LA, btw? Into it! Matcha is the business. O..My…GODDESS!!! I’ve never had a churro but now I want a plateful of them! You have an artist’s eye for presentation (to add to your talents). Makes everything look even more delicious. All about this green – and that adorable spoon!!! 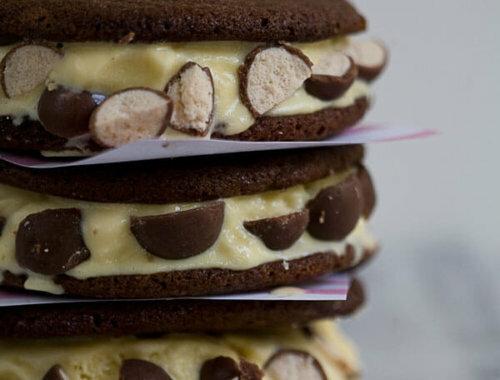 OMG these look heavenly!! Just curious to know what size your star tip is?